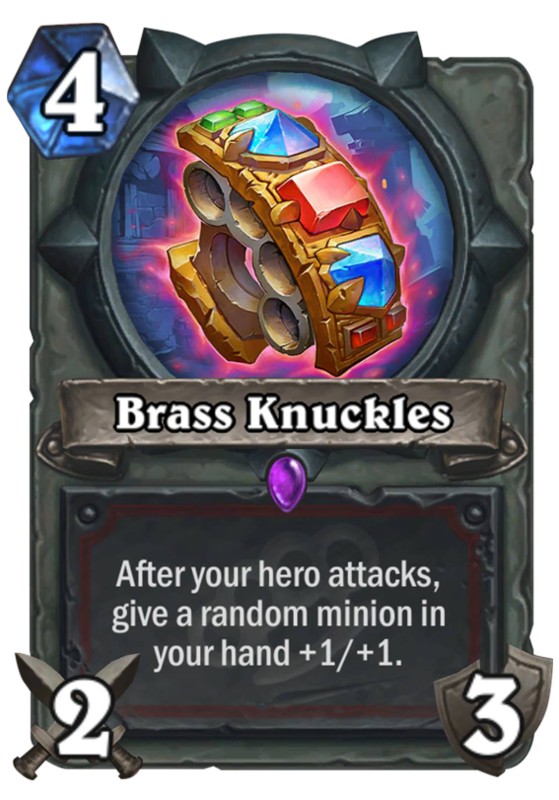 Brass Knuckles is a 4 Mana Cost Epic Warrior Weapon card from the Mean Streets of Gadgetzan set! After your hero attacks, give a random minion in your hand +1/+1. For the goon that wants to make a fashion statement. Rating: 2.6/5. From 845 votes. Is it brass or thorium knuckles? Seems to me like a good card. With weapon buffs mechanics this seems viable. It may be a slightly costly weapon but with an upgrad or one of the new weapon buffers (there is a 3/3 for 3 mana one) or even old (pirates primarily) it is quickly a strong weapon which buffs your minion up. It may be too slow and specific for competitive plays but it seems like a fun decent card to me. I think it´s better. This weapon has the purpose to attack and trade with it. Sword of Justice wants to flood the board. And the 1Attack difference is important. Fits the warrior theme perfectly. I like it, anything that could shake the Warrior meta is nice. 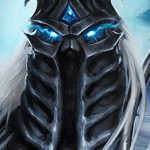 More minions oriented decks with less removals… Anyway, we’ll see. I’ve changed my mind.It won’t see much play even on arena.You simply don’t need 2 attack on turn 4. The 2/3 weapon is worth about 2 mana, and the 3 potential stagnated +1/+1 buffs are probably worth about 2 mana. Without synergies, this seems like a fair card. 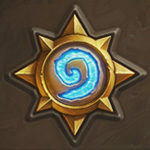 Higher durability and an effect that work well with durability means it works a lot better with upgrade mechanics, but the durability and effect also means that you would want less weapons in the deck so it is even more vulnerable to weapon removal. It’s a super cool card, but it probably won’t make too big of an impact. it requires at least 1 weapon buff to work, an easy task. it needs some minions in your hand, not so easy but not so difficult. I don’t play Warrior, so I really hope warriors play this weapon instead the 3/2 they play on turn 2 to kill my minions. quite good, if there wil be enough weapon buffs. If not, it`s too weak, because of 2 attack. Hm,yes,nice,but it probably won’t see much play in constructed but in arena it will be very good.